How to style the input type="file" button. For any styling more sophisticated than that (e.g. 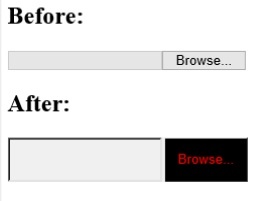 changing the look of the browse button) you will need to look at the tricksy approach of overlaying a styled button and input box on top of the native file input. The article already mentioned by rm at www.quirksmode.org/dom/inputfile.html is the best one I've seen. The best approach would be to have a custom label element with a for attribute attached to a hidden file input element. (The label's for attribute must match the file element's id in order for this to work). In terms of styling, just hide1 the input element using the attribute selector. Then all you need to do is style the custom label element. (example). 1 - It's worth noting that if you hide the element using display: none, it won't work in IE8 and below. Also be aware of the fact that jQuery validate doesn't validate hidden fields by default. If either of those things are an issue for you, here are two different methods to hide the input (1, 2) that work in these circumstances. 2.) then use this simple script to pass the click event to file input tag. now you can use any type of styling without worrying about how to change default styles. I know this very well because I have been trying to change the default styles for a month and a half. believe me, it's very hard because different browsers have different upload input tag. So use this one to build your custom file upload forms. Here is the full AUTOMATED UPLOAD code. All rendering engines automatically generate a button when an <input type="file"> is created. Historically, that button has been completely un-styleable. However, Trident and WebKit have added hooks through pseudo-elements. I am able to do it with pure CSS using below code. I have used bootstrap and font-awesome. When styling a file input, you shouldn't break any of native interaction the input provides. The display: none approach breaks the native drag and drop support. To not break anything, you should use the opacity: 0 approach for the input, and position it using relative / absolute pattern in a wrapper. Here is a working example (with additional JS to handle dragover event and dropped files). This is simple with jquery. To give a code example of Ryan's suggestion with a slight modification. Be sure to set the styling on the input when you're ready: opacity: 0 You can't set display: none because it needs to be clickable. But you can position it under the "new" button or tuck in under something else with z-index if you prefer. Setup some jquery to click the real input when you click the image. Now your button is working. Just cut and paste the value when changed. Tah dah! You may need to parse the val() to something more meaningful but you should be all set. Here is a solution which doesn't really style the <input type="file" /> element but instead uses a <input type="file" /> element on top of other elements (which can be styled). The <input type="file" /> element is not really visible hence, the overall illusion is of a nicely styled file upload control. I came across this problem recently and despite the plethora of answers on Stack Overflow, none really seemed to fit the bill. In the end, I ended up customizing this so as to have a simple and an elegant solution. I have also tested this on Firefox, IE (11, 10 & 9), Chrome and Opera, iPad and a few android devices. Here we use a span to trigger input of type file and we simply customized that span, so we can add any styling using this way. Note that we use input tag with visibility:hidden option and trigger it in the span. Basically I'm working with ng-file-upload lib, Angular-wise I'm binding the filename to my $scope and giving it the initial value of 'No file chosen', I'm also binding the onFileSelect() function to my scope so when a file gets selected I'm getting the filename using ng-upload API and assign it to the $scope.filename. This is a nice way to do it with material / angular file upload. You could do the same with a bootstrap button. Note I used <a> instead of <button> this allows the click events to bubble up. 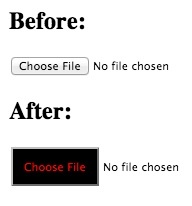 I've found a very easy method to switch the file button to a picture. You just label a picture and place it on top of the file button. When clicking on the labeled image, you select the file button. Just style a normal button however you want, then call a simple JS function to create and link a hidden input element to your styled button. Notice how the above code re-links it after every time the user chooses a file. This is important because "onchange" is only called if the user changes the filename. But you probably want to get the file every time the user provides it. Put upload file button over your nice button or element and hide it. Here's a simple css only solution, that creates a consistent target area, and lets you style your faux elements however you like. Have two "fake" elements (a text input/link) as siblings to your real file input. Absolutely position them so they're exactly on top of your target area. Wrap your file input with a div. Set overflow to hidden (so the file input doesn't spill out), and make it exactly the size that you want your target area to be. Set opacity to 0 on the file input so it's hidden but still clickable. Give it a large font size so the you can click on all portions of the target area. Update Nevermind, this doesn't work in IE or it's new brother, FF. Works on every other type of element as expected, but doesn't work on file inputs. A much better way to do this is to just create a file input and a label that links to it. Make the file input display none and boom, it works in IE9+ seamlessly. Warning: Everything below this is crap! By using pseudo elements positioned/sized against their container, we can get by with only one input file (no additional markup needed), and style as per usual. Turned this into a Stylus mixin. Should be easy enough for one of you cool SCSS cats to convert it. As JGuo and CorySimmons mentioned, you can use the clickable behaviour of a stylable label, hiding the less flexible file input element. <input id="upload-file" type="file" style="display: none"
Not the answer you're looking for? Browse other questions tagged html css file-io or ask your own question. Can we change <input type=“file”> style? How can I style input file textbox? How to style a input type=file in html?